What was the eminent French mathematician and philosopher thinking of? Surely it takes longer to write a longer letter? Well, no, actually. It’s a bit like writing this article. I have loads of things I can say, want to say and reams of handy hints to impart. But if I pour it all out onto this page, the copy will be so small you’ll need a magnifying glass to read it, and you may not want to read it anyway because you’ll think you haven’t got that much time. And, I wouldn’t have space for the natty CV the art department whipped up for me. And so, I am editing down everything I want to tell you to a few key facts. It is, in fact, taking much longer trying to work out what to cut and what to keep in and how to keep the article interesting enough for you to read in its entirety. Old Blaise Pascal was not wrong. It’s the most natural thing for a job seeker to put a lot of effort into their CV and, rightly so. The CV is almost always the deciding factor in whether you get invited for the first stage interview. Jobseekers, therefore, busily think of everything positive about themselves, to include in the CV, in the hope that the employer will find something they like. They do so in vain. The first thing to understand is that the actual decision taker is probably not even going to sort the CVs into who is seen and who is not. More likely, an administrator will be asked to go through the response first and prepare a shortlist of CVs for the decision taker to read. Or they administrator might even be the one inviting candidates for interview. If the initial person sorting CVs doesn’t see what they need on yours, they most certainly won’t read the rest of your CV and it will go straight to the NO pile. But if they do see it, and the CV goes to the decision taker, it is more than likely that your CV still won’t get read properly until you actually turn up for the interview. 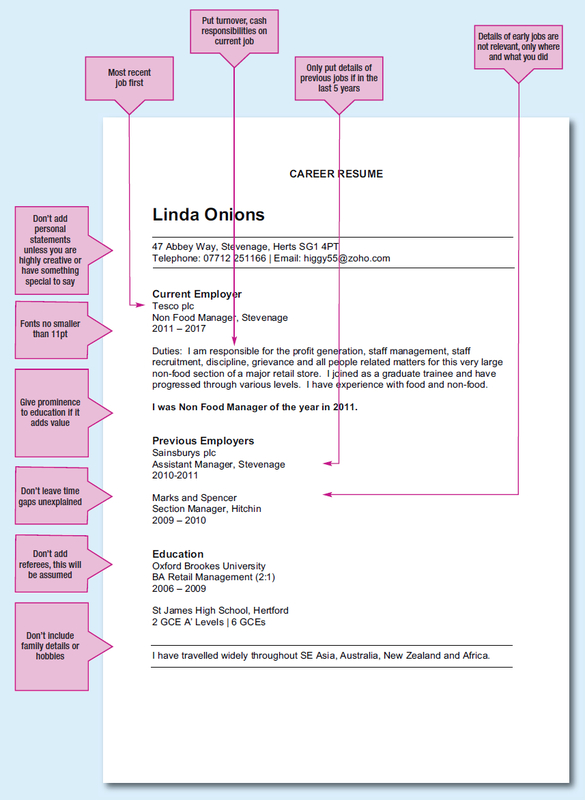 Undoubtedly, the best way to make sure the right people see the right things about you is to tailor each CV you send out to match the job advertisement or employer’s known requirements. For example, if you want to work in fashion retailing but have not worked in the sector before, your CV may not get picked for interview. So, if you have a keen interest in fashion, say perhaps it’s your hobby, then most certainly your hobbies should be included. However, if your hobby is fashion and you’re applying to a builder’s merchant, it’s probably best to leave the hobbies out. Typically, it would be the case that only minimal information about jobs held more than five years ago should be included. However, if you are seeking to get back into that particular sector or function then of course you would enhance the information about that previous job. The trouble is, in these days of internet application, people tend to scatter their CV everywhere in the hope that it will stick. They cram in every possible detail about themselves only to have the CV ignored on arrival. Taking an hour or so to closely study the jobs to which you are applying and adjusting a succinct CV to fit those roles could pay enormous dividends in getting a better job and being invited to more interviews.